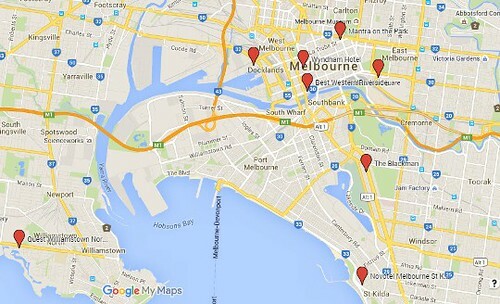 As a Melbournite who loves to play tourist in her own city, this post is one I am going to be referring to regularly. It is written by Kirralee Baker from Escape With Kids. If you haven’t checked out Kirralee’s blog I can highly recommend doing so, she shares tips for travelling as a family not only in Australis but overseas as well. Make sure you sign up for the Escape with Kids’ newsletter (you can do so by clicking here) and you will be sent the most fabulous 30 page eBook “What to Wear on a Long Haul Flight”. 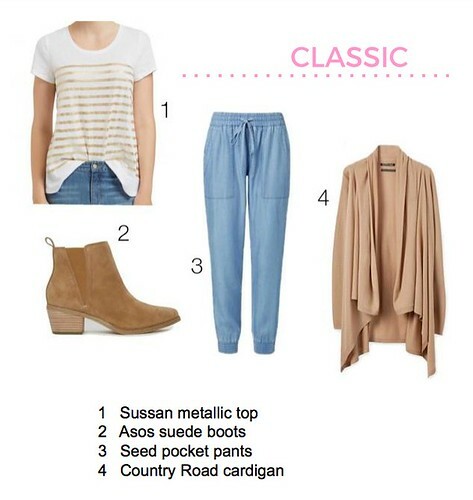 The ebook is full of excellent info with tips for flying long haul, key pieces you need to put your outfit together, the low down on compression socks and my favourite done-for-you outfits like the gorgeous photo below. 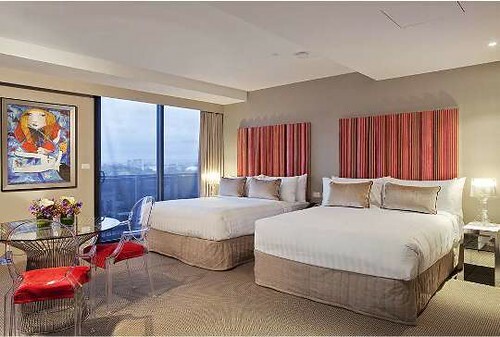 Now on to the list of kid-friendly hotels for a summer weekend in Melbourne from Kirralee and I wasn’t surprised to see The Blackman listed, it is one of my personal favourites! The excitement of checking into a hotel for a weekend can regenerate your enthusiasm for exploration. Places and activities that can’t get squeezed into a normal weekend now jump to the top of the to-do list. And Melbourne is such a family-friendly city! Even just catching a tram is a fun outing for kids. In fact it’s one of the best bits of Melbourne for kids. 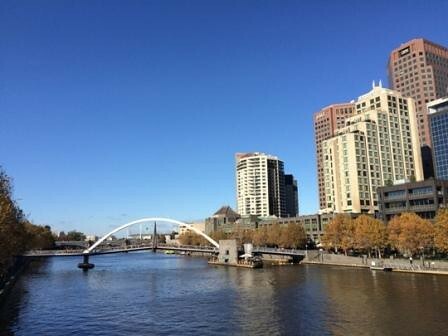 But which hotels would suit a young family wanting to have an adventure in beautiful Melbourne this summer? Location – Stay as close as you can afford to the places that you want to visit. There’s nothing quite like stepping outside and going for a wander, so it is lovely to have sights to see right at your door. Water – There’s something about kids and water. If possible, give your kids the chance to do a water-based activity sometime during the weekend, whether it’s swimming, paddling or rowing a boat. It will probably be their favourite memory! Based on the above criteria, these are my top 8 hotel recommendations. 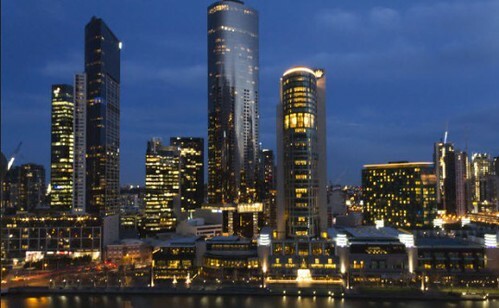 Each has been chosen for its proximity to a particular area of Melbourne. And they will all sleep 2 adults and 2 children. 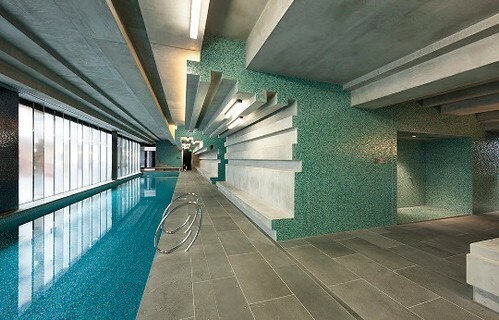 For a winter weekend in Melbourne the focus was on centrally-located hotels with beautiful indoor pools, so that there was plenty of fun to be had, even if it was cold or wet (or both!). But in summer it is best to choose a hotel close to water or parkland to be able to make the most of the warm weather. For maximum convenience, stay in the centre of town. You’ll have shops and cafes on your doorstep – the kids will love a Tiny Teddy cupcake at Little Cupcakes or a pasta at Pellegrini’s, or both! And jump on a tram going in any direction – from the Queen Victoria Market for foodies and Old Melbourne Gaol for history buffs on the north edge of the city, to the Sea Life Melbourne Aquarium for animal-lovers on the south. 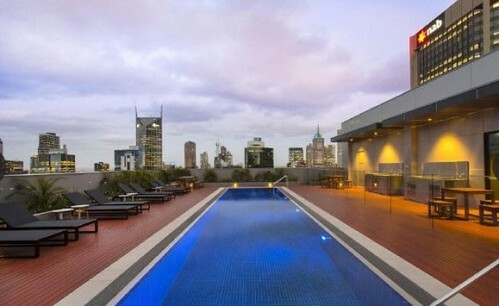 This 4.5 star hotel has a fabulous rooftop heated pool with sundeck and bbq area. A 2 bedroom apartment with kitchen, 1 queen and 2 single beds costs about $409 per night. Book here. Time your visit to catch an open-air show at the Sidney Myer Music Bowl, take a cruise along the Yarra, or scare yourself silly at the Eureka Tower. You’ll have plenty of restaurants to choose from in the Southgate precinct, and on weekdays in school holidays Melba restaurant offers adorable children’s high teas. Hedge your bets and stay by the river, but on the city side. You’re across the road from the aquarium and have the free City Circle tram at your door, but you’re also just a short walk across the bridge to Southbank. This is 4 star apartment-style accommodation, with a 2 bedroom apartment with 1 queen and 2 single beds for approximately $340 per night. I recommend requesting a quiet room to avoid potential Friday/Saturday night noise from the nightlife in King St. Book here. This is a very groovy 5 star hotel, with a rooftop tennis and bbq area, indoor pool and cinema room. It is apartment-style accommodation with your own kitchen, laundry and balcony. A Deluxe Two Bedroom Apartment with 1 king and 1 queen bed costs approximately $385 per night. Book here. 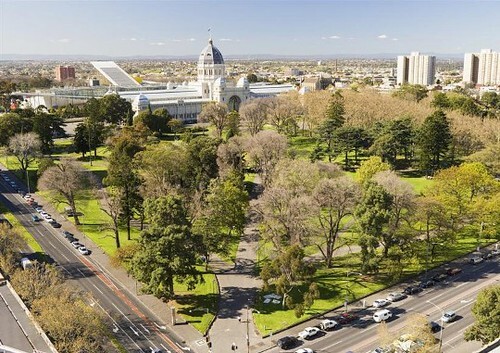 On the north edge of the city are the Carlton Gardens. This is where you’ll find the brilliant and very kid-friendly Melbourne Museum, as well as the IMAX cinema. The Lygon St Italian cafe precinct is only about a 10 min walk away. Or try cool cafe Trunk near Mantra below. 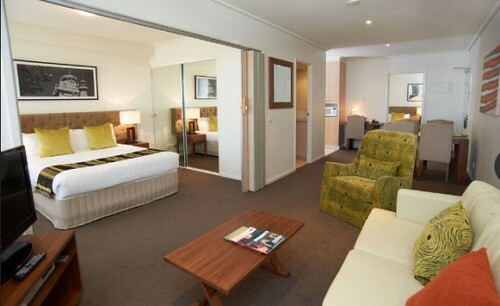 This 4.5 star hotel offers an indoor pool and apartment-style accommodation. A 2 bedroom apartment with kitchen and laundry facilities, a private balcony, and 1 queen and 2 single beds costs about $389 per night. Book here. On the eastern edge of the CBD are the heritage-listed Fitzroy Gardens. These beautiful parklands house Captain Cook’s Cottage, the oldest building in Australia, as well as the Fairies’ Tree. Nearby is the Melbourne Cricket Ground, where you can do a tour of this iconic landmark. You are also close to Rod Laver Arena and Hisense Arena if you are a sports fan. And it’s just a short walk into the city, near the “Paris” end of Collins Street. This 4 star hotel offers apartment-style accommodation with fully equipped kitchen and laundry facilities. A 2 bedroom apartment with 1 queen and 2 single beds costs about $288 per night. Book here. Remove yourself slightly from the concrete jungle down this tree-lined boulevard. You’re on tram lines that will take you to the cafes, cake shops and beaches of St Kilda in one direction. And towards the city in the other, past the National Gallery of Victoria and the Shrine of Remembrance and the Royal Botanic Gardens. And only a short walk away is Albert Park Lake and the extensive parklands surrounding it. This super cool 5 star hotel offers hotel-style accommodation, with 2 queen beds and balcony costing approximately $309 per night. If you love a bit of style and a boutique feel, then you’ll love The Blackman. Book here. For a summer weekend, it’s hard to go past staying near the beach. No parking headaches or traffic jams means more time for fun! Position yourself across the road from the beach, with Luna Park, trams, the restaurants of Fitzroy St and cake shops of Acland St within a few minutes’ walk. Don’t miss the craft market along The Esplanade on Sunday morning. If you’re lucky you might even see the little penguins coming home just after sunset each night. This hotel is 4 star and will cost approximately $287 per night for a Superior Family Room with a queen and 2 single beds. There’s even an outdoor pool for a change from the beach! Book here. Based in Williamstown you are ideally placed for a really unique weekend away. 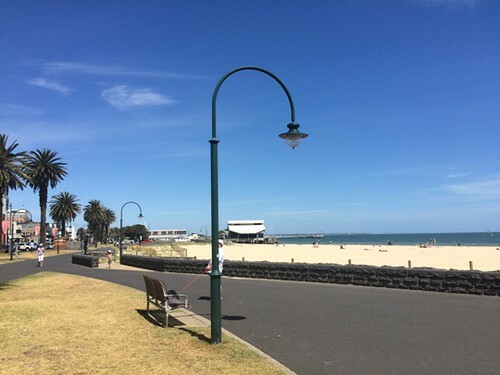 Locally you have the Williamstown beach and the gorgeous historic buildings that are now cafes, boutiques and galleries. And within half an hour’s drive is Werribee Open Range Zoo, Werribee Mansion and Shadowfax Winery, with Scienceworks even closer. Or catch a ferry to the city to get a different point of view. 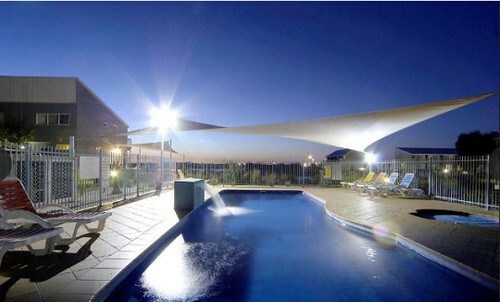 This 4 star hotel offers apartment-style accommodation with an outdoor pool. A 2 bedroom apartment with 1 king and 2 single beds costs approximately $249 per night. Book here. *Prices accurate as at Dec 2015. Kirralee Baker is a Sydney-based mum of two, squeezing her love of travel in between making lunch boxes and picking up Lego. She dreams of holidays where everyone has fun, nothing goes wrong and her suitcase is filled with fabulous outfits and tacky souvenirs. Find her at Escape With Kids or on Facebook or Instagram. Do you have a favourite kid-friendly hotel in your home town?